At one time horse chestnuts were ground and fed to horses as a stimulant and to make their coats shine. The Turks used to believe conker-meal could cure broken-winded horses. The Latin name Aesculus comes from a word that was originally applied to a type of oak but when Linnaeus the botanist drew up his original classification of species he gave it instead to the horse chestnut. ‘Hippo’ is Greek for horse, which also explains hippopotamus – meaning ‘river horse’. Meanwhile ‘kastanos‘ means chestnut. The horse chestnut is not a native species; it was brought to Britain and Ireland in the late 16th century from S.E.Europe where it grows naturally in the Balkans and in parts of Albania and Greece. It soon became a sought-after ornament and specimen tree for parks and gardens because of its potentially huge size and spectacular displays of large, candle-like flower heads (photo above from Wikipedia). In autumn the dense crown of turning leaves can give a colourful display of mixed yellows and perhaps red. The stems of mature specimens can develop characterful gnarled and bristly burrs while the bark is deeply ridged and platey. 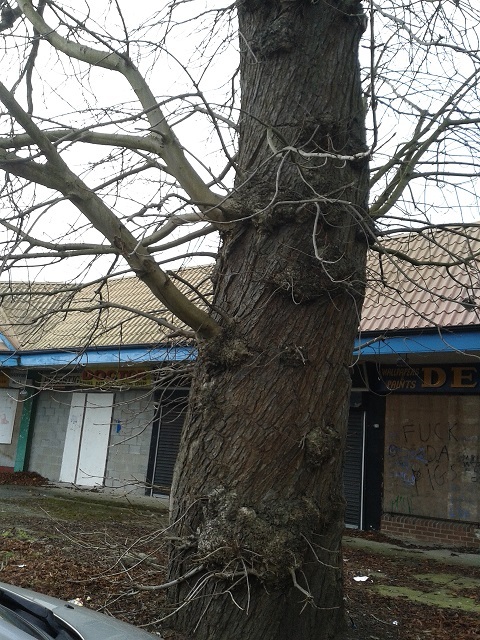 Sometimes the pattern of bark ridges may spiral around the trunk giving a twisted appearance as if the tree had been screwed out of the ground as in this specimen in a Carlow car park. While self-sown trees are common enough in woodlands its status remains that of an ornamental tree. One of the largest flowering trees in the temperate world, it can attain heights of 35m and grown in the open will develop a magnificent broad crown of heavy branches arching almost to the ground. A specimen at Killegar House, Co.Leitrim is perhaps Irelands largest with a height of 27m and girth of 4.97m. The flower heads can be up to a foot tall and are made up of a mixture of individual male, female and hermaphrodite flowers, which open in May. The flowers are mostly white, streaked with nectar-guides which are yellow at first turning to deep crimson later when the flower is pollinated. This is significant because bees cannot see the colour red so at that point the flower is effectively ‘switched off’ as far as they are concerned. 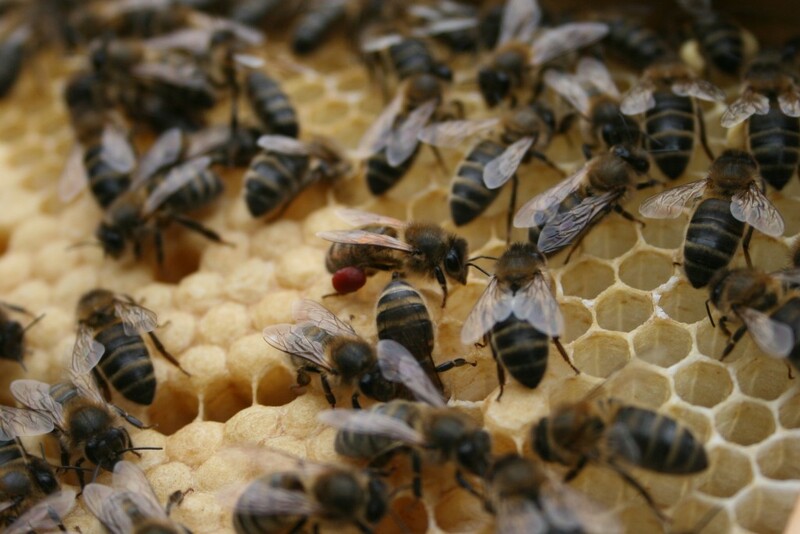 The flowering period lasts for about a month throughout which bees can be seen bringing in the distinctive brick red / crimson pollen. The honey is light and granulates smoothly. The red horse chestnut is a different species altogether – A. x carnea – a hybrid between the common horse chestnut and an American species the red buckeye a.k.a. A.pavia. It flowers slightly later than the common horse chestnut and while this extends the horse chestnut flowering period, there is evidence that too much red horse chestnut nectar is bad for bees. There are also reports from Denmark of toxicity in ordinary horse chestnut. Another species, the Californian buckeye A.californica, will yield honey in California but this too is thought to be toxic to bees. The horse chestnut is a tree of great beauty but its timber is neither use nor ornament; being uniform pale brown and lacking in strength it can only be used to make toys or trays. As firewood, it does give heat and light but it spits freely. Even as a specimen tree it is flawed because the huge arching branches have a tendency to become weak and fall unexpectedly.